We have been flooded by a recent wave of remakes (Fame, Predators, …) some of which seem redundant to say the least. I do not think it does make any sense to remake a movie that is fairly recent and to re-do it just the way it was, only exchanging the actors to attract a younger crowd of spectators. However, some movies like theater plays (e.g. Hamlet, hence the title of this post) make interesting material for reinterpretation. I remember that when I heard Hitchcock´s Psycho had been remade by Gus Van Sant I thought it was pointless but when I saw it I found that it had its charm. Adding color and playing with this gave it a totally new feel. If you want to get a bit of an impression watch this YouTube movie someone did to compare both versions. All Quiet on the Western Front is one of those movies that can do with a remake. I know it is a classic and one of the most important war movies of all times and many a reader will think it hateful to encourage such a thing. Still I believe it would benefit from it. (I know that it has already been done for TV). All Quiet on the Western Front is really old. We are talking 1930. The acting has still the feel of the silent movie era that only just ended in 1927. The acting is over dramatic. A lot of the facial expressions are exaggerated (not as bad as in the real silent movies more like on the stage). The whole pictorial language of the acting, so to speak, is hard for us to understand. To enjoy a movie like this nowadays you have to know a lot about film history and be interested in it. What works very well in the original All Quiet on the Western Front is the depiction of the atrocities of war. Whenever the focus is not on the actors it is fabulous. Hands that are gripping barbed wire but are no longer attached to a body… Those very nuanced shots in black and white accentuate the horror and give a more realistic impression. Black blood looks somehow more like the real blood than overly red blood does. All this will be a challenge for the film director of the upcoming 2012 version. I have uttered my reservations as to the cast of the new All Quiet on the Western Front (see my post on My Boy Jack and Daniel Radcliffe) but apart from that I´m curious to see if they will do the book (and not so much the film) justice. Remarques´s book is one of the best anti-war books of all times. It is so good that when I had finished it and read that it had been translated into 50 languages and sold over 20 million times I could not believe that anyone anywhere in this world could have ever wanted to start a war again. Unfortunately literature is not as powerful as that. This entry was posted in Books, Reflections, War Movie and tagged All Quiet on the Western Front, Books, Choderlos de Laclos, Cruel Intentions, Dangerous Liaisons, Erich Maria Remarque, Film Remakes, Michelle Pfeiffer, Movies, Movies based on books, Psycho, Ryan Phillippe, War Movies. Well done analysis. I agree that there is no point in doing a copy of the original but with new actors. Like covers of songs, there needs to be new interpretation of the material. I am generally against remakes because it takes time, money, and effort to make a movie. It seems a waste to do something that has already been done before. In the case of war movies, there are plenty of great stories still to be filmed. 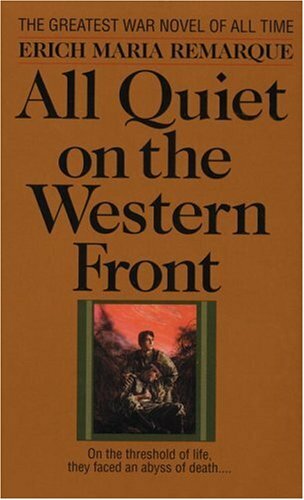 Why make a third version of “All Quiet” when the time, money, and effort could be put into a movie version of “Memoirs of an Infantry Officer” by Sassoon? This smacks of laziness and lack of creativity, but we are talking about Hollywood, after all. I do not have any problems with the second one because enough time had passed to where the technology and color justified it, but what is the point of the Radcliffe version? It looks like a stunt to me. Daniel Radcliffe – come on! They cannot be serious. No amount of special effects will overcome having Harry Potter as the main actor. However, I guess most would have said the same about Richard Thomas (and they would have been right according to you). And I know I was very skeptical about Matthew Broderick playing Shaw in “Glory” – that worked out pretty well, I must admit. I just doubt that he is a good actor but you never know. It will be interesting to see who will be playing Kat.